While the working class faithfully pays its taxes, the wealthiest elite uses elaborate schemes to get out of paying their fair share of taxes. Righteous Baek Sung Il (Ma Dong Seok) is a civil service employee who works as the Division 3 Chief at the National Tax Service who becomes fed up with the wealthiest citizens circumventing Article 38, which governs tax payments. Under pressure from his bosses to increase his division’s delinquent tax collections, Baek Sung Il tries to go after the largest tax evader in the country, Ma Jin Seok (Oh Dae Hwan), a shady Gangnam businessman. But when Sung Il and his faithful subordinate Chun Sung Hee (Choi Soo Young) are humiliated by Jin Seok and faced with possible disciplinary action, Sung Il realizes that he needs help going after the corrupt businessman. He accepts the help of professional scammer Yang Jung Do (Seo In Guk) to beat Jin Seok at his own game. 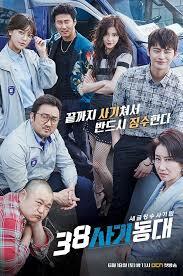 Jung Do assembles his own team of professional thieves — voice phishing expert Jang Hak Joo (Heo Jae Ho), the computer expert Jung Ja Wang (Ko Kyu Pil), beautiful hustler Jo Mi Joo (Lee Sun Bin) known, ruthless businesswoman Noh Bang Sil (Song Ok Sook) and her daughter, Choi Ji Yeon (Kim Joo Ri). This really was a delightfully good drama. As expected from an OCN drama, the story, all the characters in the gang were thought through and executed to the smallest detail. The comedy was on point! It’s a one of a kind story, not the regular thief criminal, cat and mouse hunt, but a well-thought scheme that showcases the real thiefes in the real world. If you're tired of the gooey romance and the common love triangles, and you want something more substantial go for it because this deserves all the praises it can get. Ma Dong Seok and Seo In Gook. DO i need say more? the characters in the drama are played so well, you start believing in them. They take you on a roller coaster ride and they do it well!! This drama has 3 of my favorite things in modern day Korean dramas: Ma Dong Suk, Seo In Guk and Soo Young. That said it also had one of my least favorite things: swindling or conning. I get that conning corrupt and lying people is awesome, but I rather have almost any other crime rather than that. I really dislike this theme, and I really dislike that there only was one major plot in the entire drama. I get that it's suppose to help you understand the drama easier, but what I thought was another subplot – or hoping it was, was actually just another addition to the main plot, making it too slow for me. Also I don't understand why Sooyoung's character was even in the drama – why use a famous/well known actress for a character with less than 20 lines pr. episode (20 might also be too much). The bromance was good, just not well thought off. But with two great actors even a badly written bromance looks great on a screen. As the general audience goes, this will probably fall to your liking – I personally just preferred/expected more of the writers. All in all, a good drama though a bit lacking if you ask me.